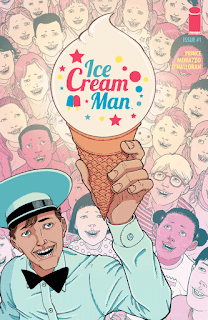 The Fellowship was fortunate enough to obtain a copy of ICE CREAM MAN #1 from Image Comics. W. Maxwell Prince writes, Martin Morazzo draws, Chris O’Halloran colors, and Good Old Neon letters. Our story begins in a sleepy little town, though the cops sure don’t describe it that way. Hwan and Briggs start their day interviewing a nice little old lady who claims a furry man ate her cat. From there they go to check on the McAllisters, who haven’t been seen in several days. What they find there definitely falls into the “weird s#! *” category. And the ice cream man is never far away. This book has an unusual premise: it’s going to be a series of one-shots that explore the wonders of the world we live in. The first story is a bit dark, at least for the McAllister kid, with an interesting narrator and a running theme with the ice cream man. It’s a well-built story, and the art is both graphic and expressive all along the spectrum. I’m a sucker for an anthology series, and this book is starting off by pushing the boundaries of comics, and doing it well. I’m excited to see what’s coming next with this one. ICE CREAM MAN #1 is available now from your local comic shop, or online at imagecomics.com.